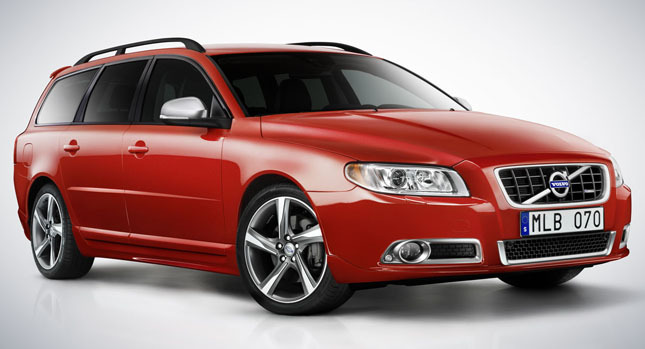 Swedish carmaker Volvo is expanding its lineup with the introduction of two new models, the top-end S80 Executive sedan and the sportier loooking V70 R-Design station wagon. Starting with Volvo’s premium sedan model, a special badge on the C-pillar hints at the enhanced features inside, which include a leather wrapped instrument panel, ventilated soft leather seats with massage function, leather-covered door panels, an aluminum center console storage compartment and an analogue clock on the dashboard. The extra thick carpets and an optional fridge in the rear seat that comes with a set of Swedish crystal glasses round off the equipment upgrades.